Headless HA: Universal influenza vaccine? A serious shortcoming of current influenza virus vaccines is the need to reformulate them every year or two as the virus undergoes antigenic drift. Many virologists have been captivated by the idea of a more universal vaccine that would endure longer, perhaps a decade or more. The identification of a conserved domain in the stalk region of the viral HA protein that gives rise to antibodies that block infection by 10 HA subtypes was a step in this direction. The next phase in the development of a new vaccine, the production of an antigen that confers broader protection, has been achieved using an HA molecule lacking the globular head. The vast majority of antibodies that block influenza virus infection are directed against the globular head of the HA, the protein essential for attachment to and entry into cells. Unfortunately, the HA head undergoes significant antigenic variation. The HA stalk is more conserved, but this portion of the molecule is likely to be masked by the globular head and therefore not readily recognized receptors on antibody-producing B cells. To make the HA stalk more accessible, an altered molecule was designed that lacks the globular head. To test whether this protein could give rise to broadly neutralizing antibodies, mice were immunized first with plasmid DNA encoding the truncated protein, and then with virus-like particles bearing the headless HA. When mice were immunized with headless HA from a 1934 H1N1 strain, all survived after intranasal challenge with the homologous virus. The sera from these mice showed broader reactivity against H2N2, H5N1, and 2009 pandemic H1N1 viruses than sera from mice immunized with full-length HA. While the observations are encouraging, they are not unequivocally positive. For example, it was not possible to demonstrate neutralizing antibodies in sera from mice immunized with headless H1 or H3 HA proteins. Furthermore, the ability of headless H3 HA to protect mice from challenge infection was not determined. Nevertheless, the results show that vaccination with a headless HA confers protection against antigenically diverged inﬂuenza virus strains. The authors conclude “Through further development and testing, we predict that a single immunization with a headless HA vaccine will offer effective protection through several inﬂuenza epidemics.” Not an influenza vaccine for life, but perhaps more enduring than those available today. J Gen Virol. 1996 Jul;77 ( Pt 7):1483-7. The immunological activity of a deletion mutant of influenza virus haemagglutinin lacking the globular region. Sagawa H, Ohshima A, Kato I, Okuno Y, Isegawa Y. 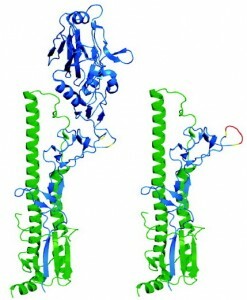 A deletion mutant of influenza virus haemagglutinin (HA; headless HA) lacking the globular region was expressed in CV-1 cells and detected with a monoclonal antibody, C179, which recognizes a conformational epitope in the middle of the stem region of HA and neutralizes all H1 and H2 subtypes. The cDNA coding for the headless HA was constructed from influenza virus A/Okuda/57 (H2N2), which was also used to select C179. The conformational epitope recognized by C179 was highly stable even after removal of the globular region. The survival rate of mice immunized with the headless HA and challenged with lethal influenza virus A/FM/l/47 (H1N1) was significantly higher than that of the control mice. The headless HA has the potential to induce cross-protection against influenza virus infection. Previous post: Futures in Biotech 60: Do you come to this cave often?